How much does it cost to travel to Cafayate? How much money will you need in Cafayate? Additional pricing is in the table below. These average travel prices have been collected from other travelers to help you plan your own travel budget. How much money do I need for Cafayate? Cafayate is located in the province of Salta, in the central zone of the Valles Calchaquies. The small town has about 12,000 residents and is 1,329 kilometers from Buenos Aires. People head to the small town of Cafayate to explore its vineyards and unique rock formations. It has become an important tourist destination in the area and there is a large golf course under construction just outside of town. Cafayate is an important wine production center. The wines in the area thrive from the low humidity mild weather of the valleys. The town receives less than 250 millimeters of precipitation a year. While Cafayate is a small town with few traditional "sights", it's definitely a wonderful place to visit. It'll give you a feel for what small town life in Argentina is like and let you see some spectacularly unique and beautiful rock formations in the area. Definitely allow yourself plenty of time to explore the town's vineyards, known as bodegas, which are quite beautiful in the area. Make sure you know what time the vineyards open and close prior to starting your day as many vineyards have irregular hours. The Museum of Wine is in the area. It highlights the influence of the wine industry on the region, and although the exhibit is well done, it is not a "must see" in the area. If you've visited your share of vineyards, then a unique alternative is the Cabras da Cafayate. This is a goat cheese farm that is about a kilometer away from the town's main square. It is well worth a visit. Many of the most impressive natural sights in the area are along the 183 kilometer National Route 68 that goes between Salta and Cafayate. Along the 165 kilometers between Cafayate and Cachi is National Route 40, which also has many points of interest. Cafayate is a small town, but its popularity with tourists means that it has plenty of amenities and comforts for visitors. It's fairly easy to find a place to sleep in Cafayate. There are plenty of affordable hostels around town, and if you're looking for something more luxurious there are also a handful of mid range and high end hotels. Many hostels and hotels include breakfast, some have swimming pools, and most have free internet as well. The town has a main square where many of the amenities are located. The vineyards, or bodegas, are located just outside of town and many can be reached with a bicycle. The main activity in the area is, of course, touring vineyards. It's possible to rent a bicycle and travel to many of the area's best vineyards. It is also interesting to visit Shell Gorge and the sand dunes. There are some excellent views and photo opportunities in the areas. You can ride up to the ravine and then hike into a cloud forest as well. You must take one of the guides at the entrance, as this is local Indian land. You can also drive about 45 minutes outside of town to see the Quilmes Ruins in the Tucuman province. This was a pre-colombian city that was conquered by the Inca and Spanish conquistadores. There are a handful of decent restaurants throughout the town, many of which cater specifically to tourists. You can easily find empanadas, tamales and humitas, all of which are quite good and cheap. One unique and interesting option which you should definitely try at least once is the local ice cream made specifically from local wine. There are some great ice cream shops on Ruta Nac 40 between C.Q de Nino and Cordoba. Cafayate can be reached by bus from the city of Salta in about four hours. There are six buses every day. Buses also travel to Cafayate from Tucuman and the trip takes approximately five hours. There are four buses a day, but it is important to note that this route sometimes closes when the rains are bad. If your budget isn't so tight you can easily hire a guide in Salta. They will provide you air conditioned, private transportation from Salta with an English speaking driver. You can also choose to stop along the way at bodegas, towns, and historic points of interest along the way. Once you reach the town of Cafayate, it is small enough to explore easily on foot. If you want to travel outside of town, a bicycle is probably your best option. Taxis are available near the town's main square. These taxis can take you to any of the vineyards if you choose not to rent a bike. Taxis do not have meters, but prices are usually reasonable. There are no car rental places in Cafayate, but it is possible to rent a car in Salta. The ride from Salta to Cafayate is part of the true experience. It's nothing less than dramatic. The road passes through stunning desert lined with rows of mountains and strikingly red peaks, particularly as the sun starts to hit the desert ground. There are countless buttes, spires, and plateaus along the way, making it somewhat similar to Monument Valley in the United States. It's definitely a ride to remember. 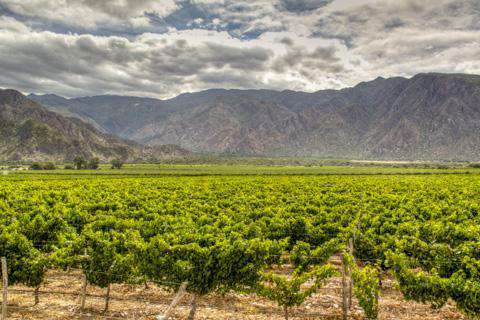 Cafayate comes in a close second in Argentina as a great place for wine. You can try the great dry white wine which is made from Torrontes grapes. There are also some good red wines produced in the area. Because of Cafayates altitude and climate, it is ideal for wine production. While there is far less wine made in this area than Mendoza, most of the wineries here are family owned, giving them a more intimate atmosphere. The wineries are with very close proximity to the town itself, making it a convenient place to explore. It's a great place to buy wine, because many options are only available within the province, making them a unique purchase.